As astronomers discovered that we live in a great big universe, they considered a fundamental question: is the universe the same everywhere? Imagine if gravity was stronger billions of light years away… Or in the past. It sounds like a simple question, but the answer has been tricky to unravel. Why do we assume that the Universe is homogeneic and isotropic for all observers? — Cornell U.
Dr. Pamela Gay: With me this week while Fraser is on a well-deserved vacation is Dr. Chris Lintott of Oxford Astrophysics. Good afternoon Chris. Dr. Chris Lintott: Hi, there. How are you? Pamela: I’m doing well. We survived! We’ve been down here in Long Beach, California for the 213th meeting of the American Astronomical Society and the launch of the International Year of Astronomy. Dr. Lintott: Well congratulations you helped to launch the International Year of Astronomy in the U.S. I noticed. The rest of us will catch up next week when that’s the International launch. [Laughter] But it was great fun. We had a movie premier which was excellent – free beer and all sorts of good things. Pamela: All courtesy of Interstellar Studios and it was the launch of 400 Years of the Telescope. We had Galileo Beer from Sierra Nevada. Dr. Lintott: And the Second Life Island opened. Pamela: The Second Life Island opened. We had George Hrab from the Geologic Podcast who does the theme music for 365 Days of Astronomy. Which you all should go and subscribe to at iTunes. Dr. Lintott: Which I do an episode for so..
Pamela: Yes you do and we already have some AstronomyCast episodes in there. So yeah, we got through. Fraser’s now on vacation and you and I are here to make sure that AstronomyCast keeps going through all these different chaotic wonderful things. This week we’re going to talk about the Cosmological Principle. As astronomers discovered that we live in a great big Universe they considered a fundamental question. Is the Universe the same everywhere? Imagine if gravity was stronger billions of light years away, or in the past. It sounds like a simple question but the answer has been tricky to unravel. The answer kind of starts with this crazy thing called the Cosmological Principle. Dr. Lintott: So now you just want me to explain it. [Laughter] I love the way that you make it sound like it’s got the capital letters it deserves. Before we tell you what it is, let me explain why it is important. The Cosmological Principle isn’t something we’ve discovered about the Universe. This isn’t like the age of the Universe or the process by which galaxies form or even the fact that most of the matter is in the form of this mysterious dark matter. Those are facts that we’ve established. The Cosmological Principle is an assumption that we must make in order to say anything about the Universe as a whole. What we have to do is we have to assume that the bit of the Universe we can see and get information from is typical of the whole because if that’s true then we can make local measurements. We can do the equivalent of a table top experiment on our bit of the Universe. We can measure the density and say this must be the density of the whole Universe. We can look at the conditions around us and say these must be the conditions in the whole Universe. That enables us to do any cosmology. We can say things about the Universe as a whole. Not just our little bit of the Universe looks like it started 13.7 billion years ago but the whole Universe began 13.7 billion years ago. For these grandiose claims you need to make this assumption. You need to say the Universe is big and we live in a typical small part of it. Pamela: And so having reached this mediocre state of being nothing special, nowhere special and perhaps as we’ll talk more on this show, in no when special we move on and we look at two big concepts. The idea that the Universe is homogenaic and that the Universe is isotropic and with isotropic it’s your work with Galaxy Zoo that’s actually helped look at evidentially how can we say isotropic is real? Dr. Lintott: In the small way. Another way of stating the Cosmological Principle, keep in the back of your head during this episode, all it is, is that we don’t have anywhere special. We have to think about it in technical ways if we want to test it. One way to say it technically is the Universe is both homogeneous on large scales, and isotropic. Now what isotropic means we take that first is that it looks the same in all directions. So if I look right into the distant Universe I will see a Universe that looks much like the one I see if I look left. Same if I look up and look down, that way it doesn’t matter which direction I choose to look in. The Universe is the same on large scales. So we’d like to test that. One way to do that is to look at galaxies. You can set up a thought experiment. Let’s look out of the window in the hotel room here. Imagine every galaxy in that direction was rotating clockwise, all in the same direction. Now imagine an alien astronomycast presenter [Laughter] well, another alien astronomycast presenter, looking back from the other side at those galaxies. We see them clockwise, he, she or it would see them moving anti-clockwise. So, there you have a measurement that depends on which direction you’re looking. In that Universe isotropy is broken. So we thought with Galaxy Zoo inspired by the work of Michael Longo we should double check this wasn’t the case and to our horror, we found as most of your listeners know by now, more galaxies appear to be going anti-clockwise than clockwise. The reason this result was so disturbing and controversial and why I had great fun stirring up cosmologists [Laughter] with this is if that had been true then in some sense the Cosmological Principle is broken and you wouldn’t be able to say anything at all about the large-scale Universe. Pamela: Now what it turns out is, it’s more the human mind is a little bit broken. Dr. Lintott: Sure, we have a bias we think and that means that actually when we do the test properly, looking at mirror images and so on – on galaxyzoo.org – in case any of your listeners haven’t come and helped us out, then we find consistency with Isoptropy. Astronomers aren’t satisfied with that they weren’t hanging around waiting for us. What you want to do is test these things on the largest scale possible. So we look at our largest scale observation of the Universe which is the Microwave Background. This is as you know radiation emitted 300,000 years or so after the Big Bang from the point where light suddenly was able to travel across the whole Universe. Pamela: We have an entire AstronomyCast episode about this so go check it out if you want to learn more about the Cosmic Microwave Background. Dr. Lintott: And if you’re still here, [Laughter] then all you need to know for the CMB at this point is that it is a picture of the Universe – part of the Universe as it was 300,000 years after the beginning. In fact, we find it works. If you look to the right then look to the left, if you look up and you look down you see a Universe that looks very similar. For example you can characterize this Universe by temperature. The Universe is the same temperature at that time to better than one part in 10,000 wherever you look. It is incredibly smooth. Actually it is so smooth that it causes a problem. Pamela: This is actually quite troubling because we’re just starting to see the light – by definition – that’s traveling from the left side and we’re just starting to receive the light that’s traveling from the right side. Dr. Lintott: So they haven’t had time to cross or to communicate with each other. Pamela: How do they know what temperature to be? How do they know what distribution of hot and cold spots they should have? Dr. Lintott: The famous way of looking at this is even if there are monsters in each part of the Universe with heaters and fridges whose job it is to try and match the temperature with their other monster colleagues, there’s no way they could do so. They can’t talk to each other so they can’t coordinate their activities. Pamela: These parts of the Universe are accelerating themselves apart with the Universe’s expansion. Dr. Lintott: So they will never talk to each other. The monsters will be left alone [Laughter] with a fridge and a heater and presumably some sort of electricity supply. It’s a fundamental problem called the Cosmic Conspiracy. One way out of it – monsters aside – is to just say there’s something about the Big Bang that produces smooth Universes. Pamela: This is where we invoke the idea of inflation. Dr. Lintott: Sure, inflation is the idea that, take your standard Big Bang, something happened, the Universe has been expanding, and just allow me to tweak it slightly so that in the first tiny fraction of a second there was an incredibly rapid expansion. Pamela: After those two pieces of the Universe talk to each other? Dr. Lintott: Yes because then you can have a much smaller Universe to begin with. The monsters can communicate. Light can travel from one side to the other. Even if there were random fluctuations in temperature, then heat will flow from the hot region to the cold region and things will reach equilibrium and then you expand and then you have the Universe we see today. So, inflation is another route out of this. But we’ve digressed a long way from the Cosmological Principle. The point was we’re halfway there. We have an Isotropic Universe as far as we can see. Pamela: Then the next thing we have to start worrying about is the idea of homogeneity. Here side scale starts to become very important. You look around our own planet Earth and compare it to Mars – very different worlds. Look around our solar system. Our solar system isn’t like other solar systems that we’ve found so far. There are probably some out there like us somewhere. Look at our galaxy. Our galaxy is part of a local group that is a bit different from the stuff beside it. So, on these small scales everything is a little bit different. Dr. Lintott: To make it even more simple than that, if we want to, we don’t really mind whether it is a planet or galaxy or whatever. Take a box, let’s say a meter cubed. Let’s put that box down somewhere in the Universe and ask how much matter is there within it. Obviously I’m going to get a different answer if I put it down in the middle of the Earth [Laughter] it will have much more mass than if I put it down a hundred miles up above my head where there will be very little. Yet there will still be more there than if I put it a billion light years away, not in the middle of any galaxy. The odds are there will be nothing at all. So you see the density on that scale changes. It matters where in the Universe I put the box. If I have a much larger box, a really large one, say a billion light years on the side, then wherever I put that in the Universe the assumption we’re making is that there’ll be roughly the same amount within it. The Universe is homogeneous on that scale. If you want a local analogy, take cake. It’s always good to take cake. [Laughter] Imagine a sponge cake with raisins in it. It matters if you have a pin prick you put into the cake. It will matter whether you go into the cake or you go into a raisin. So on those scales, the scale of a pin head; you get very different answers to what the cake is as you prod your pin in and out. But if you look at a box, if you take a slice of cake it doesn’t matter where that slice comes from, as long as you’re not picky about icing on the top [Laughter] or whatever, because you’ll always get raisins and cake in roughly the same constituency. So you want a big enough box that you care about raisins and cake and not about individual things. Pamela: We see this just within subdivisions here in the United States. Dr. Lintott: What’s a subdivision? Pamela: Well, this is where for whatever reasons developers decide everyone is going to live in very similar houses with very similar yards. Dr. Lintott: In English we say estate, but still. Pamela: So I’m sitting in my plain Jane back yard on my plain Jane yard and the grass around me is a bit different than the back patio I can see. But, if I expand my box to contain yard and patio I can start to average out. It’s still lumpy, bumpy not very smooth. If I instead expand my circle out and I take in my house, my yard, my neighbor’s houses and yards, there is still variety. There is always that person with the pool. There is always the person who decided to build an addition over the garage. Dr. Lintott: But if you take a big enough section there is probably always two pools scattered among them. They’ll be in different in places, attached to different houses but the density of the pool would be the same. Pamela: Anyone who has tried to find someone living in a subdivision knows that really, everything looks the same. Everywhere, once you’re trapped within all the winding roads. Dr. Lintott: Sure, so what this boils down to is you’ve got take a big enough box for our Universe to be homogeneous. We need it to be so so that the Cosmological Principle applies and cosmologists can be happy. Have we had a big enough box to test it? I think the answer is just about no. Obviously our galaxy scale box won’t do. Obviously the size of the local group won’t do. You must have something bigger than the biggest galaxy clusters. 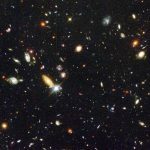 The biggest view of the Universe we’ve got is the Sloan Digital Sky Survey, a picture of a million galaxies. Even on the scale of the Sloan survey, it’s not quite big enough to see homogeneous. There are very large fluctuations across the Sloan, some very large scale features which may or may not be important. So if we go a bit bigger than that we believe that we’re dealing with a homogeneous Universe. But we’re not sure. Pamela: We live basically in a Swiss cheese Universe. The problem is well we all know Swiss cheese has holes and well cheesy bits of various different sizes. One of the problems we also have in trying to understand these issues of scale is the Universe’s structure is evolving over time and we have to correct for that in some ways. Dr. Lintott: Yes, once you get to very big. With Sloan we’re just about okay. Once we get to the big scales we have to worry about changes with time. So think about it. We talked about the Microwave Background, this very smooth but not quite smooth, tiny fluctuation, one part in 10,000 at early Universe. And yet we look around us today and we have this galaxy cluster or not galaxy cluster, very lumpy Universe. Both are homogeneous as far as we can tell. But the scale of the fluctuations has changed. That’s entirely due to the beautiful work of gravity which takes the small fluctuations that existed at the beginning and exaggerates them. You mentioned being in a region in the Microwave Background Universe, 300,000 years after the Big Bang. That has more matter than its surroundings. It will have slightly stronger gravitational pulls so material will tend on average to flow into it and away from the less dense regions. So the rich get richer, the poor get poorer. These differences exaggerate every time you go from the smooth Universe of the CMB to the fluctuations we see today. It’s a great triumph of modern cosmology that that calculation works out correctly. But if you start with the observed Microwave Background, apply what we know about gravity and this other force, dark energy that I’m sure we’ll get on to at some point, you produce something that looks much like the web of galaxies that we see today. Pamela: What’s really neat is there have been some recent studies where they’re trying to figure out the bulk motions of one group of galaxies relative to another. You start adding up the forces you get from this cluster over here, that cluster over there and you actually have to take into account that lack of gravity coming from these voids in space. Dr. Lintott: Sure the regions that aren’t pulling you quite as closely as the galaxy cluster on the other side. We actually see some of these motions on very large scales. The work is slightly controversial. There were some press releases and papers out a few months ago. There’s a suggestion that cross motion of the Sloan is a net motion in one direction. If that’s true, that means we haven’t yet reached the scale on which things are homogeneous. Just outside our field of vision there must be a really big compression of matter pulling us in that direction. Pamela: One of the things that we have to deal with as we look out and we try and decipher the evolution of the Universe from the not quite but mostly smooth Cosmic Microwave Background to today’s Swiss cheese Universe is we’re assuming a model that has a given amount of mass, a given amount of energy and gravity affecting things in a consistent way. Dr. Lintott: Ah, okay now this is the hard question, right? So far we’ve dealt with Cosmological Principle as if it depends on space. We’ve talked about this being a special place, but of course that’s not the only problem. Imagine, let’s be archaeologists looking at the surface, or anthropologists looking at the Earth. You’d want to make the same assumption. If you’re going to take a small region of the Earth’s surface and study the people there you want to know that that is typical in order to draw conclusions about the whole of human population. However, you’d also want to know what time you were living in and see whether you were living in a special time. If you were in Rome 2000 years ago, you would draw very different conclusions from studying Rome today. For all I know the chariots driving habits were the same. [Laughter] You know what I mean. Time is very important. We have to be careful not to make the same mistake with the Universe. In particular, we just assume that the laws of physics that we measure in the lab today are those that governed the Universe of 300,000 years after the Big Bang of three seconds after the Big Bang; of three micro-seconds after the Big Bang. And all the way back we assume physics is the same. Pamela: One of the nice things is that even though we are making this rather radical assumption, we’re able to build mathematically consistent models that allow us to in computers simulate what we’re actually observing. Dr. Lintott: Right so that’s one way we can be sure that things are working. We make the simple assumption that physics works and so far so good. But we can also test it directly. Let’s take something simple. Let’s assume that all of physics is the same. Einstein’s still right wherever you are in the Universe and quantum mechanics does whatever quantum mechanics does and all the rest. Let’s change one thing. Let’s change the speed of light. Pamela: Now, the speed of light is one of those numbers that crops up all over physics. It’s sort of like Pi and Fe but the difference is it actually has meaning. It describes the rate at which photons travel through space. Dr. Lintott: It has such meaning. It’s the fundamental definition of the second. But what it means to count time depends on the speed of light. We count oscillations in cesium. Is that correct? Pamela: It’s cesium it’s the resonance. Pamela: No, it’s still cesium. We did an episode on this recently so if you want to know more about time, go back three or four episodes. Pamela: I’m not getting paid. Dr. Lintott: Anyway, the point is so the speed of light is something we can physically measure. It’s at the heart of the Theory of Relativity. Everyone seems to know. They only know two things about Einstein, they know E=mc2 probably a topic for a show you’ve already done. Dr. Lintott: There you go. And they know that the speed of light is a constant, at least in a vacuum. The true statement is in a vacuum. So, given that everyone knows this, can we test it in the early Universe? The answer amazingly is yes. We can measure the speed of light not just here but we can measure the speed of light a billion years after the Big Bang. Pamela: This is because of the fine-structure constant which is one of those quantities that helps describe in quantum mechanics the energy level transitions that cause light to be released at very specific wavelengths in different atoms where each element has its own fingerprint of allowed colors of light that it emits. Dr. Lintott: So when you look at a street light that distinguishing yellow glow is because sodium always emits in the yellow for example. When we look at distant galaxies we see loads and loads of these lines from all the different elements that are there. It’s how we know what galaxies are made of. You can take one particular element like hydrogen for example and you see literally hundreds of lines in the spectrum of the galaxy from just hydrogen. Now the gaps between those lines depends on this thing called the fine-structure constant. It doesn’t matter what it is, one over 137 or so in appropriate units. It’s nicely [Laughter] memorable. But that depends on the speed of light. So if the speed of light changed when we looked at distant galaxies we should see this ladder of lines due to hydrogen changing and we don’t. We see them in exactly the same ratio as they should be to better than one part in a hundred. There’s no evidence for any change whatsoever. Pamela: That better than one part in a hundred is an error bar. Not saying that it’s changing within that. Dr. Lintott: No, it’s consistent to zero. Pamela: Yes as near as we can tell the speed of light is the speed of light is the speed of light. As we build progressively larger and larger telescopes we’re looking back to the very first galaxies that have ever formed. With those first lights from elements being emitted you see this consistent fingerprinting of the elements. Dr. Lintott: We do but you’ve still got a problem because that only takes us back to alright I’ll concede the earliest galaxies were, so first galaxies maybe half a billion years? Something like that after the Big Bang? So let’s say we can repeat this experiment from that. We’re not far off being able to do that and yet I’m sure the speed of light would be consistent with being a constant back then. That’s not enough because lots of the things we’d like to explain happened before that. For example we talked earlier about the smoothness of the early Universe, the isoptropy of it the fact that temperature was the same on one side of the sky as the other. You, I think or one of us brought up the idea of inflation as a solution to this, this rapid expansion. Which works, it solves this problem and a few others. I always describe it matches this as trading several problems for one crazy idea because that’s what it is. There is no physical reason to believe in inflation. There’s no theory that tells us that the Universe should suddenly it sped up its like expansion. Pamela: It’s just mathematically works. Dr. Lintott: Sort of, it’s not even that but it’s if you allow this to happen by forcing the equations to do it, then you’ve solved lots of your problems. So, physicists are alert for other solutions which might be more elegant and solve the same thing. One such set of theories is called variable speed of light theory or VSL. It’s been worked on and off for the last 20-30 years by a whole variety of people, particularly by João Magueijo at the Imperial College in London who wrote a book on the subject. The book is called “Faster than the Speed of Light” and it’s possibly the rudest cosmology book [Laughter] I’ve ever read. It’s worth it for entertainment value alone, you should read the book. His idea is that if the speed of light changed dramatically in those early days before we can measure it, then you can get away with inflation. You can allow different parts of the Universe to talk to each other. You can see how this might happen. If you speed up the speed of light then the seemingly disparate parts of the Universe can communicate very quickly. It’s like having high speed broadband connection [Laughter] and instead of resorting to dial-up. They can reach the same temperature and then the Universe can go on with its merry way with the speed of light settling down to normal. It’s a beautiful, probably wrong idea. But it at least seems to fit within the way we’d like scientific discovery to go. Newton wasn’t wrong. You can fly to the moon with Mr. Newton. He was just inaccurate at high speeds or near large masses. So maybe, the suggestion goes, Einstein wasn’t wrong. The speed of light is constant except in the early Universe. Pamela: This always gets us to the question of testability. The problem is, right now we have fingerprints going back to the formation of the first galaxies. When we try and look back before that, we can’t. It’s the cosmic dark ages when we’re in a Universe where there’s just nothing hanging around emitting new light. Dr. Lintott: Actually there’s a lot more work to be done on the theory. So, who knows? It may be the theory will make predictions as to how things will change later in the Universe. At the minute it’s still not much more than a fun idea. It’s a toy idea. I don’t mean that as derogatory as it sounded. It’s a description of “let’s break this and see what happens” physicists’ model. Let me give you another example though. We’ve been playing with breaking the Cosmological Principle in the early Universe. There are reasons to want it to be broken nearby as well. A few radical cosmologists are beginning to advocate. Lots of people have been involved in this. There was some recent work that got me thinking from my next door neighbor in Oxford, Tim Clifton who has the office next to me and Pedro Ferreira and Kate Land from Galaxy Zoo. They’ve been thinking about how to get rid of this pesky dark energy. Now you must have an episode on dark energy. Pamela: I think it was the last one we recorded. Dr. Lintott: There you go. Dark energy is an accelerating force that is apparently driving the expansion of the Universe onward and onward and onward faster and faster. No one ordered it. No one wanted it in their model of the Universe. It doesn’t make any sense and we don’t understand it. We just see its effect. Most cosmological effort is going into trying to explain it, to pin down its properties and explain what this accelerating force is. Or, you can allow me to do the following thing, saying Tim, Pedro and Kate. Allow us to be somewhere special. In fact, allow us to be sitting not in a perfectly typical region of the Universe but near the center of a large void. A region of space that has less stuff in it than the surroundings, than the average and that gets rid of dark energy it turns out for a very simple reason. When we talk about the expansion history of the Universe – accelerations and decelerations and gravity and dark energy – what we’re really talking about is a local measurement at the rate of expansion. We measure that here and we get a certain value. Pamela: And this is after we’ve corrected for all the local motion. Dr. Lintott: Yeah and all that astrophysics nonsense [Laughter] as well and understood the stars we’re looking at and so on. That’s just detail. Imagine being in the center of the void and we look out further and further and we make this measurement by looking at supernovae or Cepheid variables or whatever your standard candle of choice is. Pamela: And we have a show on this. Dr. Lintott: Sure, excellent [Laughter] you’re good. Your competition for this week is to string all the AstronomyCast episodes into one sentence and [Laughter] send it to me. The point was, as you look further and further away and you’re leaving the void so you’re measuring the expansion in a Universe that appears to be getting denser, more gravity, and greater pull back on the expansion so there’s slower expansion. So as we look out of the void the expansion slows down. That’s the same as looking in the past so we interpret that as an acceleration. Who knows if that’s true? The scale of the void that you need turns out to be very deep. We need to be about two-thirds of the average density of the whole Universe. That’s quite a large discrepancy. Pamela: But we know that there are huge variations in density across the Universe. Dr. Lintott: We don’t see anything on that scale on what we can see. So then the question is what scale must this point be? You’ll be amused to know, no doubt, the prediction is that it should be slightly larger than our existing surveys can detect. In other words if we had something that went twice as deep as the Sloan Digital Sky Survey does then we’d see the edge of the void and we’d see this increase in density. So, it’s a prediction. If this exists, if we happen to be living not just in a point but near the center of it – we need to be at the center of it – otherwise we’d see the difference if we looked in different directions. But we know we don’t do that. If we live in such a world, we can get rid of dark energy and we can all react. It will take the advent of the next generation of sky surveys, particularly the Large Synoptic Survey Telescope, in let’s hope 2015 [Laughter] no let’s hope for 2015. Dr. Lintott: Let’s hope for 2015 to do that. At least it is a prediction. For now we’ll cling to the Cosmological Principle. Pamela: So we have a theory, we have a test, we have a telescope on the way and when everything goes live and when the science results are back, we’re going to have to have you back on the show Chris. It’s been a pleasure. 365 doa podcast sure is great but hey,don`t forget this one.I need my weekly pamela and fraser dose,doctors order. Thank you for the new podcast. We missed you!! Hey, this was a fantastic show. Loved it. Are there any links you can provide that give a bit more info around that alternative theory on dark energy discussed towards the end of the show? It sounded really interesting. sweet, thanks. didn’t mean to jump the gun or rush you guys. I enjoyed this show alot as it cast Pamela into Fraser’s role with Chris Lintott being the expert and Pamela translating his answers. It worked well and I found it very informative particularly as I thought the subject matter was a difficult one to get across but I felt by the end I had a good idea about the cosmological principle and even explained it to my teenage son later. Have you (Pamela) perhaps thought about inviting more guests onto your regular podcast shows? Not that I would want to hear less of Fraser! I’d love to hear how the velocity of light can ever be anything other than constant when your units of distance and time are both defined in terms of wavelengths and durations of oscillations of light whilst light’s velocity is dependent on exactly the same properties (see http://www.simetric.co.uk/sibasis.htm for the SI definitions). This has bothered me since I first learnt the definitions and I’ve not yet found an answer that doesn’t either produce a circular argument or club the question into submission with Einstein and Michelson/Morley. Looking forward to some good answers. Really enjoyed this one. Very technical, but understandable, and very challenging intellectually.